Richard Taylor was diagnosed with dementia, probably of the Alzheimer’s type, when he was 58 years old. Now 66, Richard speaks to the public about living with the disease and sends out a challenge to the Alzheimer’s outsider. 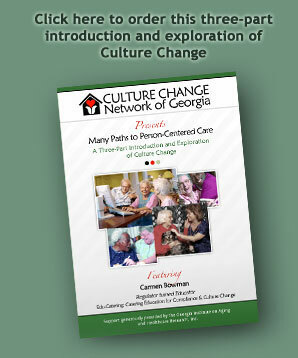 This is the first DVD in a series of Richard’s “TODAYs.” Join Richard as he speaks from his heart, urging all of us to recognize that “THERE IS A PERSON IN THERE.” It is a remarkable documentation of his presentation to aging services professionals, urging them to embrace the culture change philosophy of person-centered care. For anyone who knows, interacts with, works with, or provides services to people with dementia. Richard Taylor’s collection of more than 80 provocative essays about his personal experiences with receiving and living with a diagnosis of dementia, probably of the Alzheimer’s type. Receiving a diagnosis of Alzheimer's disease profoundly alters lives and creates endless uncertainty about the future. How does a person cope with such a life-changing discovery? What are the hopes and fears of someone living with this disease? How does he want to be treated? How does he feel as the disease alters his brain, his relationships, and ultimately himself? Richard Taylor provides illuminating responses to these and many other questions in this collection of provocative essays. The former psychologist courageously shares an account of his slow transformation and deterioration and the growing division between his world and the world of others. With poignant clarity, candor, and even occasional humor, more than 80 brief essays address difficult issues faced by those with Alzheimer’s disease, including: the loss of independence and personhood, unwanted personality shifts, communication difficulties, changes in relationships with loved ones and friends, and the declining ability to perform familiar tasks. "I am Richard Taylor, and for nearly a decade I have lived with the diagnosis of dementia, probably of the Alzheimer's type. I have discovered that thinking, speaking, and writing about what it is like for me to live with this condition has become the purpose of my life." © Copyright HaveAGoodLife.com. | Atlanta Web Designers.